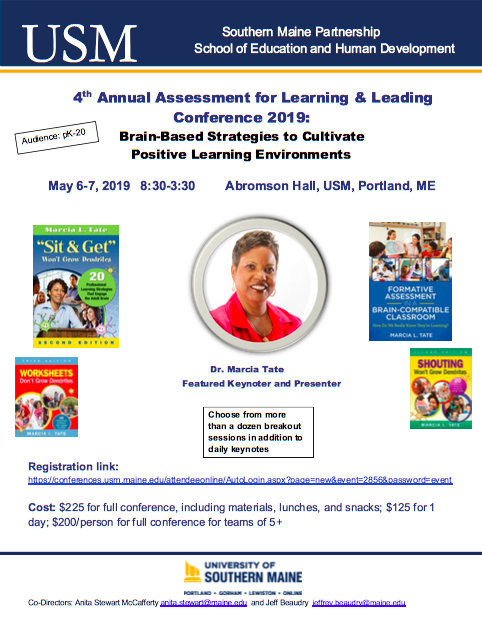 4th annual Assessment for Learning & Leading Conference 2019: Brain-Based Strategies to Cultivate Positive Learning Environments. May 6-7, 2019, Abromson Hall, USM, Portland. REGISTRATION! Dates: August 4th and 5th, 2016, 8:30 a.m. – 3:30 p.m.
Goal of the data symposium to improve curriculum and instruction decisions through the use of data. Thursday, August 4th, 8:30 a.m. – 3:30 p.m.
Friday, August 5th, 8:30 a.m. – 3:30 p.m.
Dr. Beaudry proudly serves the Southern Maine Partnership is a regional collaborative as co- director. With over twenty publications many on visual literacy, concept mapping, technology, and science and mathematics achievement in professional journals and program evaluation publications, Dr. Beaudry aims to explore issues relating to the visual learning, assessment literacy, formative assessment, arts and assessment, STEM, and action research. In March, 2016, Jeff’s book, Research Literacy, co-authored with Dr. Lynne Miller, was published, and will be a textbook for research methods and data analysis in education. He co-edited a book with Lenny Shedletsky, Cases on Teaching Critical Thinking with Visual Representations. Since joining NWEA in 2013, Tim has served partner districts as a Professional Development Consultant on NWEA’s Professional Development Team. In this role, Tim works directly with district and school administrators, teachers, and parents to deliver coaching services and job-embedded professional learning. He draws on almost thirty years in the educational world to connect the dots between assessment and instruction, and to bring assessment literacy to NWEA partner districts. Tim takes great pride in collaborating with districts to develop custom Professional Development that will meet a school or district’s specific needs. Prior to joining NWEA, Mr. Neville worked as a principal, assistant principal, educational consultant, coach, and teacher. He holds a bachelor’s of science degree in Elementary Education from Keene State College and a master’s of arts degree in K-12 Education Administration and Supervision from the University of New Hampshire. In addition, Tim received a certificate from Harvard University’s Change Leadership Group, a research initiative at the Harvard Graduate School of Education for meeting the changing needs of public education. Ms. Smith’s more than 10 years as a classroom teacher led to a 10 year position as a K-8 literacy coach within MSAD #51. In 2011, in response to statewide inquiry, she founded the consulting group Logos Literacy and began offering literacy coaching services specializing in reading and writing workshops to districts across the state. 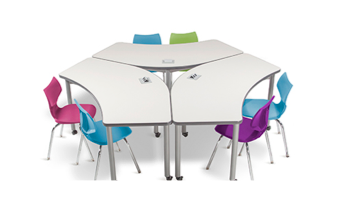 Logos offers one-day workshops, multiple day institutes, lab-site demonstration, and literacy coaching. Ms. Smith and her team support teachers in instructional methodology, content and the strategies requisite to ensure success for all learners. In addition to her work in Maine, Kellie was also fortunate enough to have been chosen to support the implementation of writing workshops at the Kaohsiung American School in Taiwan. Kellie has also presented at multiple conferences including NERA, ILA, and The East Asia Regional Council of Schools (“EARCOS”). Education from the University of Southern Maine. Ms. Smith is also a former National Board Certified Teacher. Logos LLC, Literacy Consulting Group. Ksmith@logosliteracy.com. Kellie earned her B.S. in Child Development Family Relations from the University of Maine and a M.S. in Literacy. Cost: $300 per participant – this includes materials, breakfast, lunch and snacks throughout the two days. * We encourage school teams to attend. The fourth person is free. For more information, please contact Susan Inman, Program Manager for the Professional Development Center (PDC) at USM, susan.inman@maine.edu, phone: 207-780-5055.